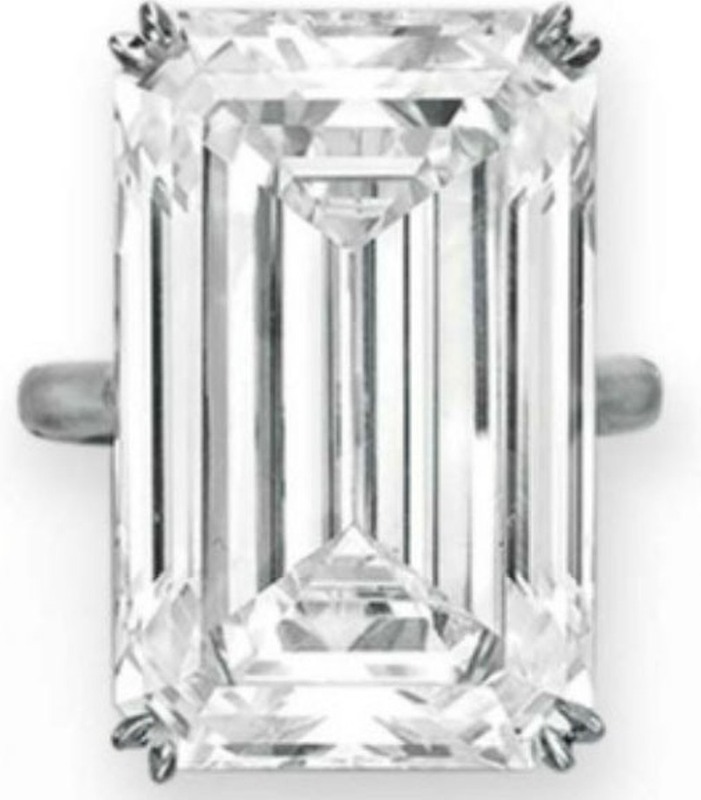 Christie’s has announced the holding of its New York Magnificent Jewels Sale on December 10, 2014 bringing to a successful end the end-of-year jewelry auction season for the year 2014. The auction to be held in two sessions at the Christie’s flagship Rockefeller Center salesroom will offer a total of 323 lots, expected to register a total turnover of over US$55 million. The morning session beginning at 10.00 am will feature Lots 1 to 152 and the afternoon session beginning at 2.00 pm will feature Lots 153 to 323. The estimates of the lots range from as low as US$1,000 to as high as US$10,000,000. The auction features a variety of rare and top-quality jewels, including exceptional colored and colorless diamonds, stunning colored stone and natural pearl jewels, as well as signed and period jewels, including exquisite creations from renowned jewelry houses such as Rene Boivin, Boucheron, Bulgari, Cartier, Fouquet, Graff, JAR, Tiffany & Co., Van Cleef & Arpels and Harry Winston. Based on the pre-sale estimates arranged from high to low, out of the first 30 lots only four lots – 8th, 12th, 25th and 26th lots – are either natural pearl or colored gemstone lots. The remaining 26 lots are all either colored or colorless diamond lots. Hence, colored and colorless diamond lots feature prominently, with several fancy colored diamond lots and not less than 16 D-color diamond lots on offer at the auctions. Top lot of the sale is Lot 323 – An Important Diamond Pendant – set with a pear-shaped, D-color, VVS1-clarity diamond weighing 89.23 carats, mounted in platinum. 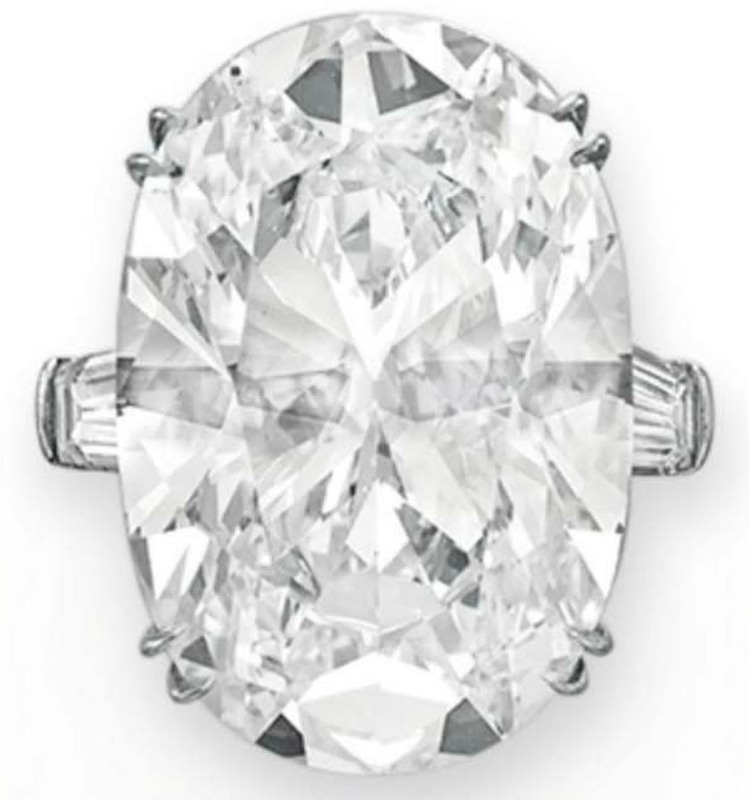 GIA certifies the 4Cs of the diamond as well as the finding that the diamond is Type IIa, a rare class of diamonds with no chemical impurities or structural abnormalities that can impart color to diamonds, and hence are absolutely colorless; sometimes referred to in superlatives as “whiter than white,” “brighter than bright,” and “diamond of the purest water.” D, E and F color diamonds fall under this category and constitute only about 1-2% of all naturally occurrring diamonds. 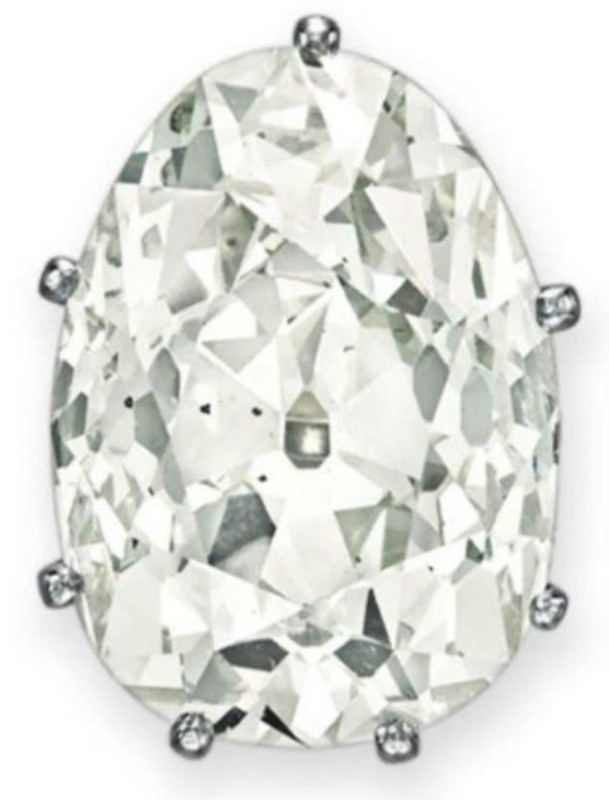 Christie’s website says that estimate of this lot would be provided on request, but going by the estimates of such D-color diamonds at public auctions the estimate could not be less than US$10 million. The third highest lot of the sale is Lot 140 – A Spectacular Suite of Colored Diamond And Diamond Jewelry by Jahan – with a pre-sale estimate of US$3.5-5.0 million. The exquisitely crafted suite consists of 1) A Necklace 2) A Bracelet 3) A Pair of Ear Pendants and 4) A Ring. 1) The Necklace – The 50 cm. necklace suspends seven fringes made of variously-cut fancy colored diamonds, with various shades of yellow and brown, weighing 52.30, 50.96, 36.46, 20.41, 14.13, 11.54 and 11.51 carats. The fringes are suspended from the neckchain, set with variously-cut diamonds and colored diamonds, of various fancy shades of yellow and brown; the eight largest weighing from 42.14 to 4.15 carats. The backchain is set with circular-cut diamonds and colored diamonds, of various shades of pink, orange, yellow and brown. GIA certifies the 4Cs of 19 diamonds in the necklace. 2) The Bracelet – The 21 cm. bracelet is set with variously-cut diamonds and colored diamonds of various inshades of brown and yellow. 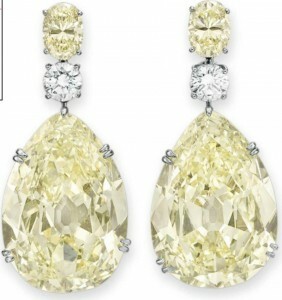 The largest colorless diamond weighs 13.78 carats and the largest colored diamond 30.60 carats. GIA certifies the 4Cs of 4 diamonds in the bracelet. 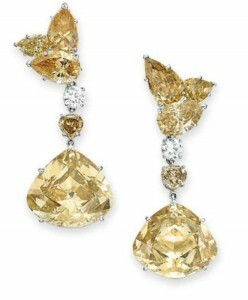 3) Pair of Ear-Pendants – Each ear-pendant suspends a modified heart-shaped fancy brown-yellow diamond weighing 33.48 carats and 28.36 carats. GIA certifies that the 33.48-carat modified heart-shaped diamond is fancy brown-yellow, natural color and VS2-clarity; and the 28.36-carat, modified heart-shaped diamond is fancy brown-yellow, natural color and I1-clarity. 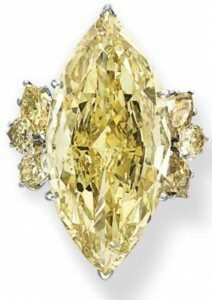 4) The Ring – The ring is set with a marquise-cut fancy brownish/greenish yellow diamond, weighing 32.16 carats. GIA certifies that the 32.16-carat, marquise-cut diamond is fancy brownish greenish yellow, natural color and SI1-clarity. 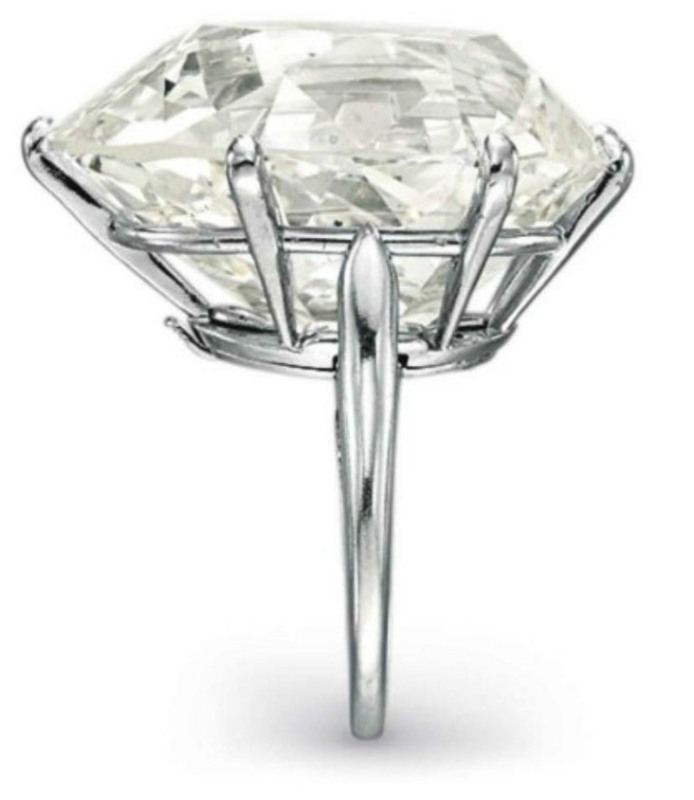 Lot 152 – A Magnificent Diamond Ring by Bulgari is another highlight of the sale. The ring estimated at US$3.5-5.0 million is set with an oval-cut, D-color, VVS1-clarity diamond weighing 32.32 carats, flanked on either side by a tapered baguette-cut diamond, mounted in platinum. GIA while certifying the 4Cs of the diamond stated earlier, also provides a working diagram indicating that the clarity of the diamond may be potentially Internally Flawless (IF). GIA further certifies the finding that the diamond is a rare Type IIa, chemically pure and structurally perfect diamonds that are absolutely colorless falling under the color-grading D-F.
Another highlight of the sale is Lot 276 – A Magnificent Pair of Colored Diamond and Diamond Ear Pendants with an estimate of US$2.5-3.5 million. 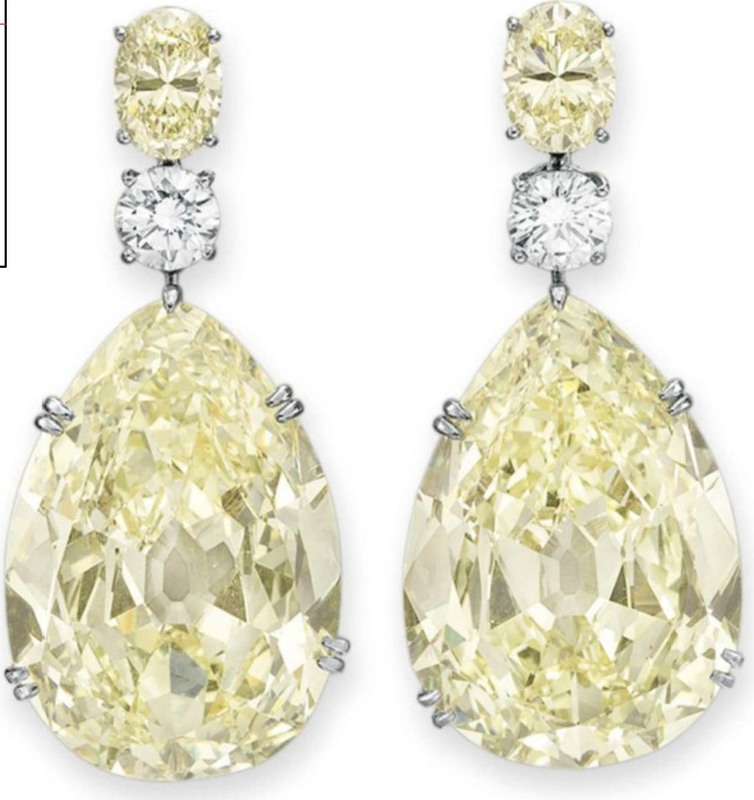 The Ear-Pendants are set with a matching pair of pear-shaped, fancy light yellow diamonds, weighing 52.88 carats and 51.46 carats, with a circular-cut colorless diamond and an oval-cut light yellow diamond surmount, mounted in white gold. 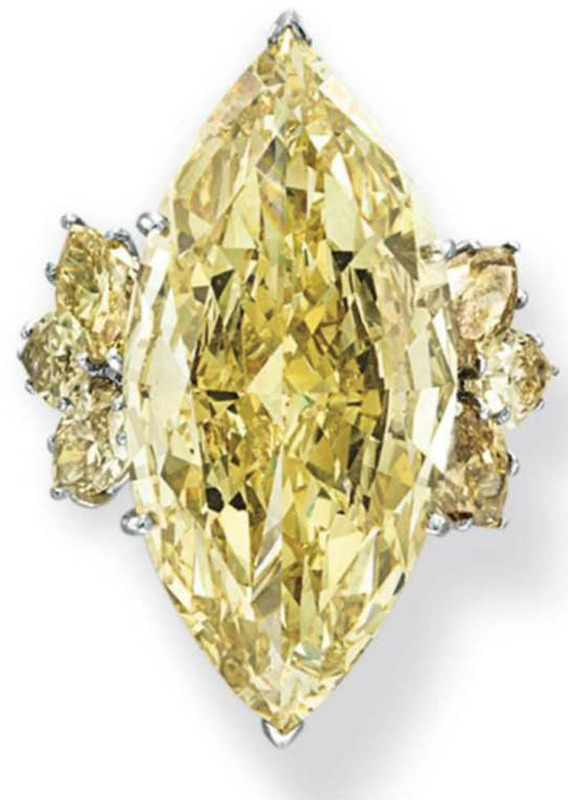 GIA certifies that both the 52.88-carat and 51.46-carat pear-shaped diamonds are fancy light yellow and natural color, with clarity grades of VS1 and VS2 respectively. Lot 277 – A Diamond Ring by Van Cleef & Arpels is another prominent lot of the sale, with a pre-sale estimate of US$2.2-3.2 million. 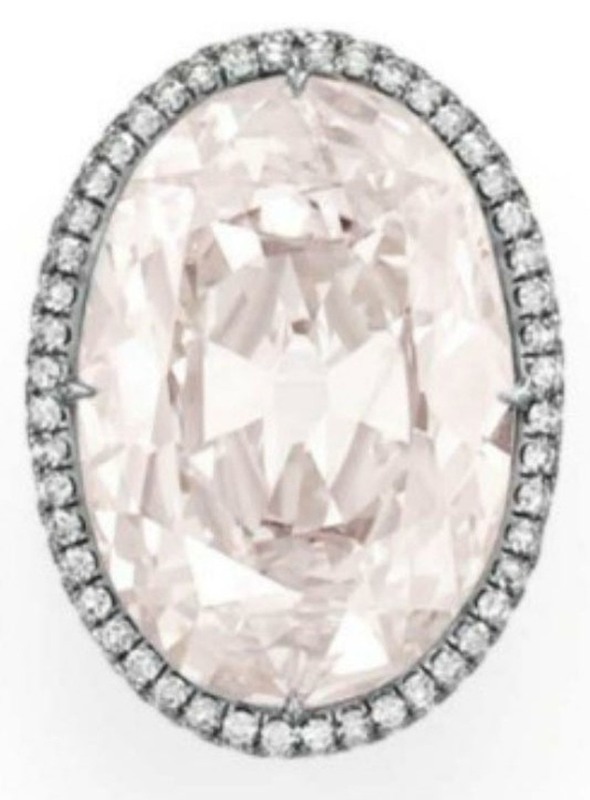 The ring is set with a modified pear-shaped diamond, weighing 74.89 carats, mounted in platinum, with a detachable ring hoop and accompanied by a detachable pendant hoop, a baguette-cut diamond link and a circular-cut diamond link. GIA certifies that the 74.89-carat, modified pear-shaped diamond is K color and SI1 clarity. Another prominent lot from the sale is Lot 311 – An Impressive Diamond Ring – with a pre-sale estimate of US$2-3 million. The ring is set with a rectangular-cut, D-color, VS1-clarity diamond weighing 32.72 carats, mounted in platinum and white-gold. GIA certifies the 4Cs of the diamond, as well as the finding that the diamond is Type IIa, chemically pure and absolutely colorless, which confirms the D-color status of the diamond. However, one lot that would undoubtedly receive international attention, is an extremely rare red diamond discovered at the Argyle Diamond Mine in Australia, weighing just 1.42 carats, yet the 3rd-largest fancy red diamond ever offered at an auction. The unmounted diamond is assigned Lot No. 197 and titled “A Rare Unmounted Colored Diamond.” GIA certifies that the diamond is a modified oval-cut, fancy-red, natural color, VS2-clarity diamond weighing 1.42 carats. Another gem identification report issued by Argyle Pink Diamonds certify that the origin of the red diamond is from the Argyle Diamond Mine, Western Australia. 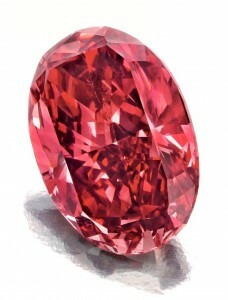 An estimate of US$1.5-2.5 million is placed on the red diamond. The Phenomenon of red diamonds is extremely rare, so much so, that if one says that only a very small number of natural red diamonds exist in the world today, it is not an exaggeration. Actually the number of diamonds certified as red, existing in the world today, is less than twenty. Therefore, seeing a red diamond in public is an extremely rare event, let alone being available for sale. The largest fancy-red diamond that appeared at a public auction is the 1.92-carat, radiant-cut unnamed red diamond that appeared at a Phillips de Pury, New York Auction in Oct.2001 and sold for USD 1,652,500. The second largest fancy-red diamond that appeared at a public auction is also coincidentally a 1.92-carat diamond but with a rectangular-cut that appeared at a Christie’s Geneva auction in May 2013 and sold for US$3,252,675 setting a world record for price-per-carat for a red diamond of US$1,694,101. Another colored diamond highlight of the sale is Lot 74 – A Colored Diamond And Diamond Ring – set with a modified cut-cornered rectangular-cut, fancy blue diamond, weighing 5.70 carats and flanked on either side by a tapered baguette-cut diamond, mounted in platinum. The pre-sale estimate of the lot is US$1.5-2.5 million. GIA certifies that the 5.70-carat modified cut-cornered rectangular-cut diamond is fancy blue, natural color with clarity grade of VS1. 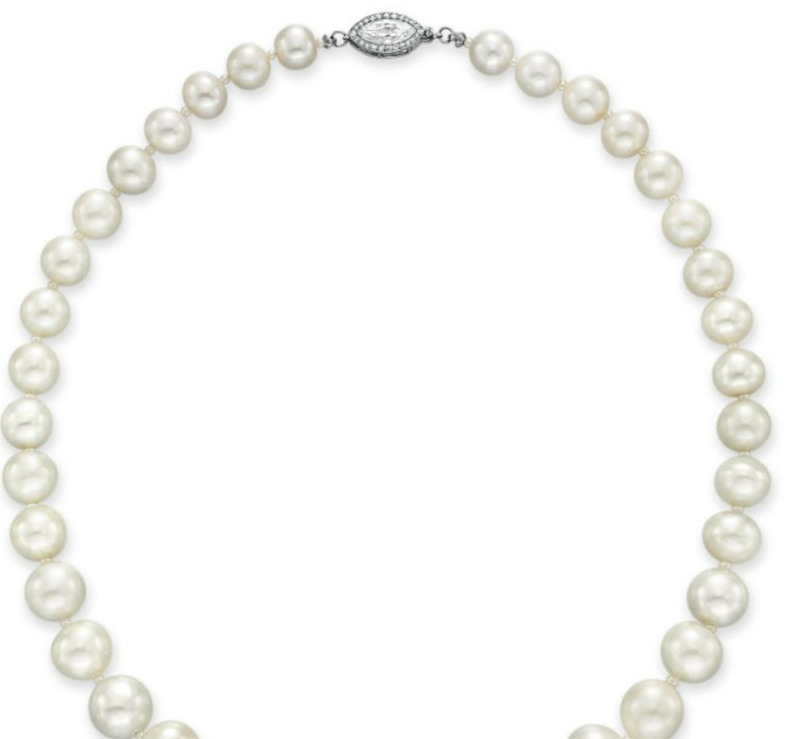 The pearl jewelry lots are led by Lot 141 – An Important Single-Strand Natural Pearl And Diamond Necklace – with a pre-sale estimate of US$1.5 – 2.5 million. The 41 cm. 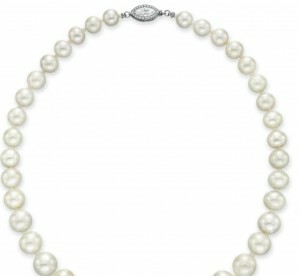 Cartier necklace is composed of 37 natural saltwater pearls with diameter varying from 8.00 mm to 13.10 mm. The platinum clasp at the rear of the necklace is mounted with a marquise-cut diamond surrounded by a layer of circular-cut diamonds, and signed Cartier. 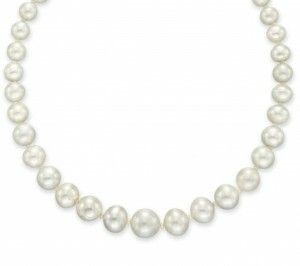 Swiss Gemmological Institute (SSEF) certifies that the pearls in the necklace are natural saltwater pearls. Given the much enhanced prices realized by natural pearl jewelry at recent public auctions, this pearl jewelry lot will be watched keenly by jewelry enthusiasts and collectors the world over, to see how it performs at this Christie’s auction. Lot 275 is another natural pearl lot, titled A Natural Pearl, Colored Diamond And Diamond Ring with a pre-sale estimate of US$200,000-300,000. 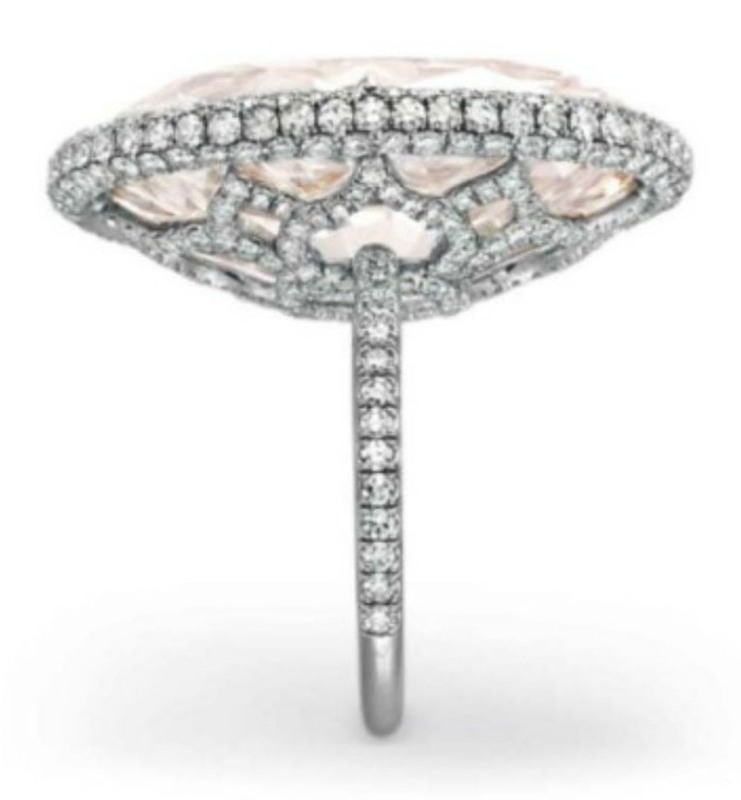 The ring is set with a button-shaped natural pearl, within a pave-set circular-cut diamond pronged surround, enhanced by six collet-set circular-cut pink diamonds at the depressions between two prongs, mounted in rose and white gold. 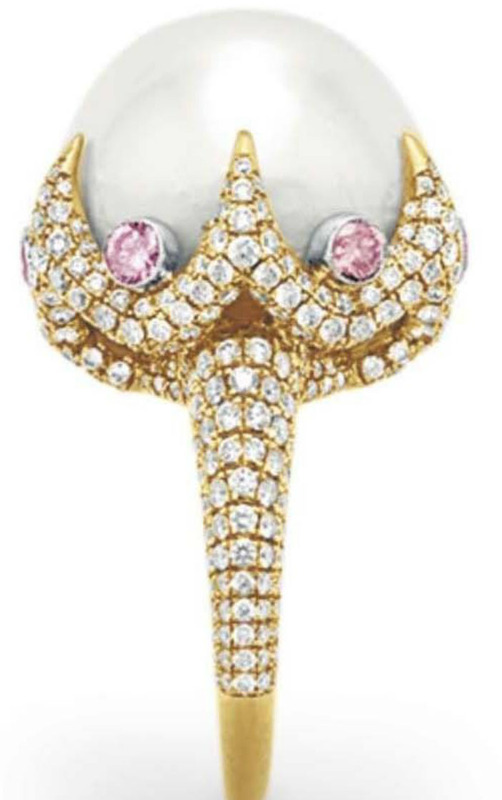 The weights of the pearl, pink diamonds and colorless diamonds are not known, as the stones cannot be dismounted without damaging the setting. 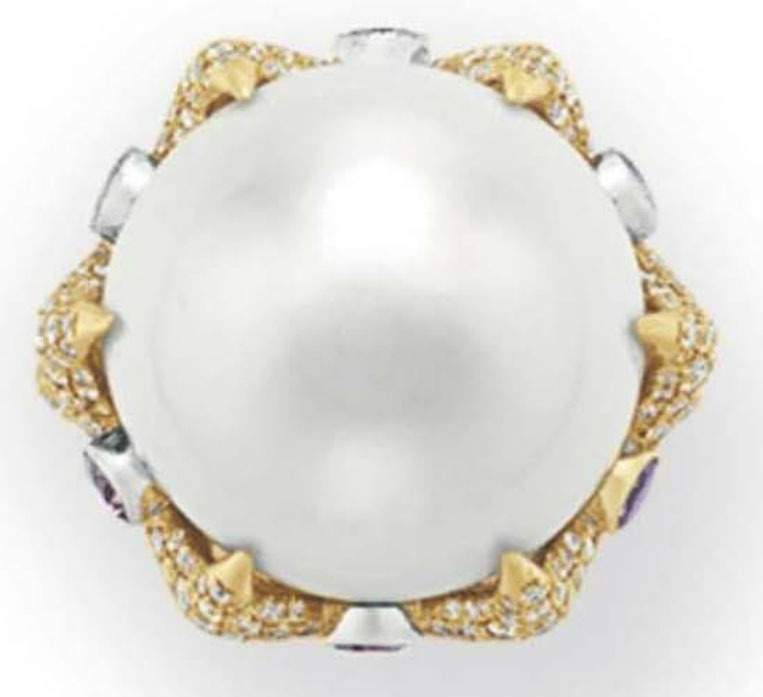 SSEF certifies that the button-shaped pearl is a natural saltwater pearl. 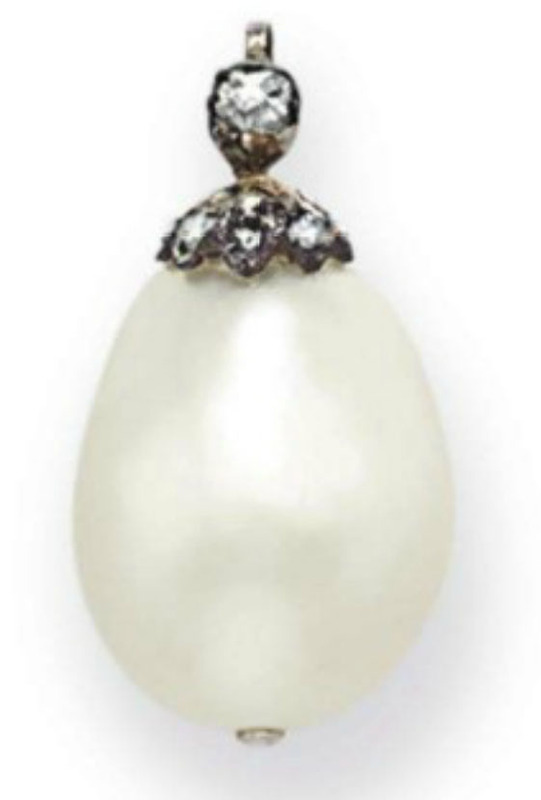 Lot 273 – A Pair of Natural Pearl And Diamond Pendants – with a pre-sale estimate US$80,000-120,000 is another pearl jewelry highlight. The pendants are set with perfectly matched drop-shaped natural pearls, with dimensions of 11.75 – 12.90 x 16.50 mm and 11.60 – 12.95 x 15.85 mm, suspended by a bell-cap arrangemet set with rose-cut diamonds, with an old-mine cut diamond surmount, mounted in silver, with a pendant hook for suspension. One rose-cut diamond is deficient. Both SSEF and GIA confirm the natural saltwater origin of the drop-shaped pearls with no indications of treatment. The Sapphire lots are led by Lot 316 – A Fine Sapphire And Diamond Ring – with a pre-sale estimate of US$1.2-1.5 million. 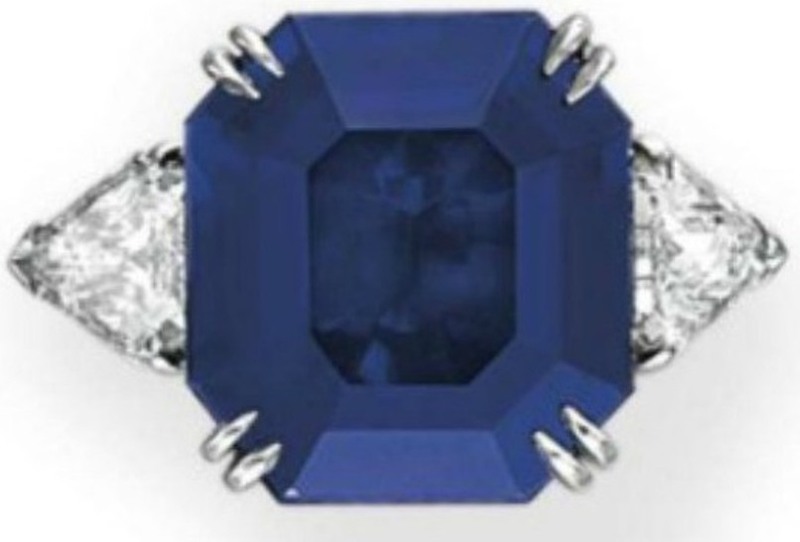 The centerpiece of the platinum ring is an octagonal-cut Kashmir blue sapphire weighing 12.06 carats, flanked on either side by a triangular-cut diamond. Two lab reports by GGL and AGL certify the Kashmir origin of the blue sapphire with no evidence of heat enhancement, with supplementary reports attesting to the rarity of the blue sapphire. 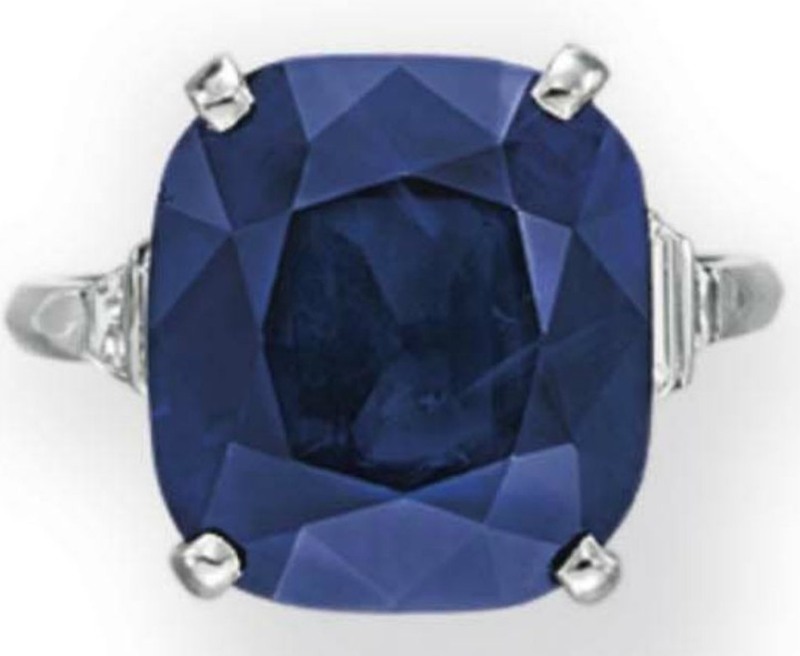 Lot 110 is another sapphire lot featuring at the auction, titled A Sapphire And Diamond Ring, Mounted by Van Cleef & Arpels, and with an estimate of US$300,000-500,000. The centerpiece of this platinum ring designed by Van Cleef & Arpels is a cushion-cut, Sri Lanka blue sapphire weighing 17.27 carats, highlighted by a circular-cut diamond surround. AGL certifies the Sri Lanka (Ceylon) origin with no gemological evidence of heat enhancement. Lot 220 – A Sapphire And Diamond Ring – with an estimate of US$250,000-350,000 is another highlight of the sale. The centerpiece of this platinum ring is a cushion-cut Burma sapphire weighing 17.98 carats flanked by trapeze-cut diamonds mounted on the shoulders of the ring. Two lab reports by AGL and GIA certify the Burma origin of the sapphires with no gemological evidence of heat enhancement. 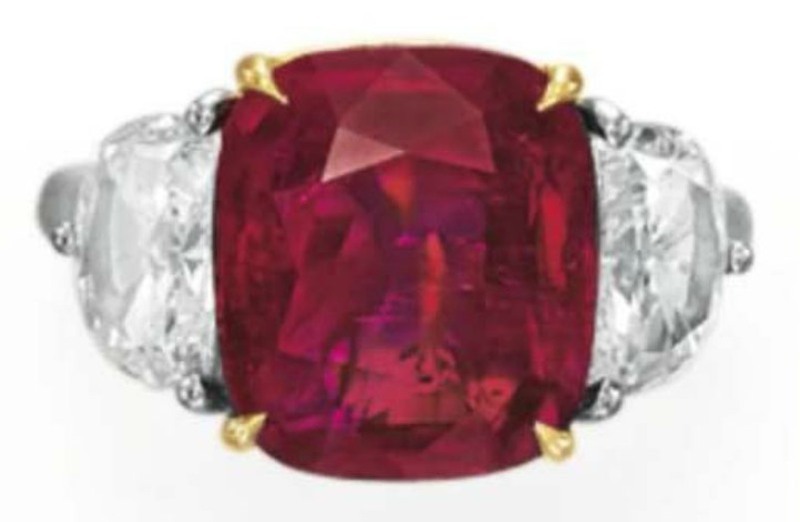 Some of the Ruby lots that feature prominently at the auctions are Lots 194, 302 and 78. Lot 194 – A Rare Ruby And Diamond Twin Stone Ring – has a pre-sale estimate of US$450,000-650,000. 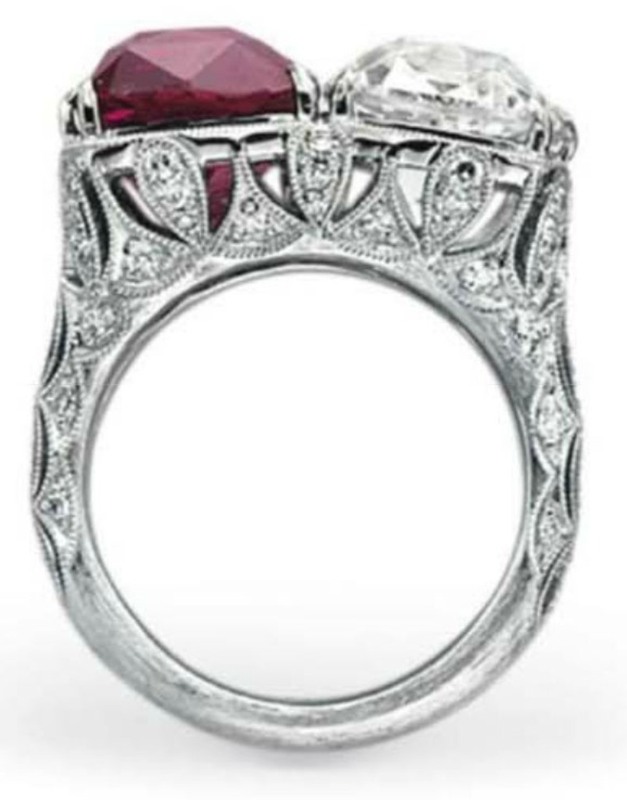 The 18k white-gold twin-stone ring is set with a ruby and diamond matching in shape and dimensions. 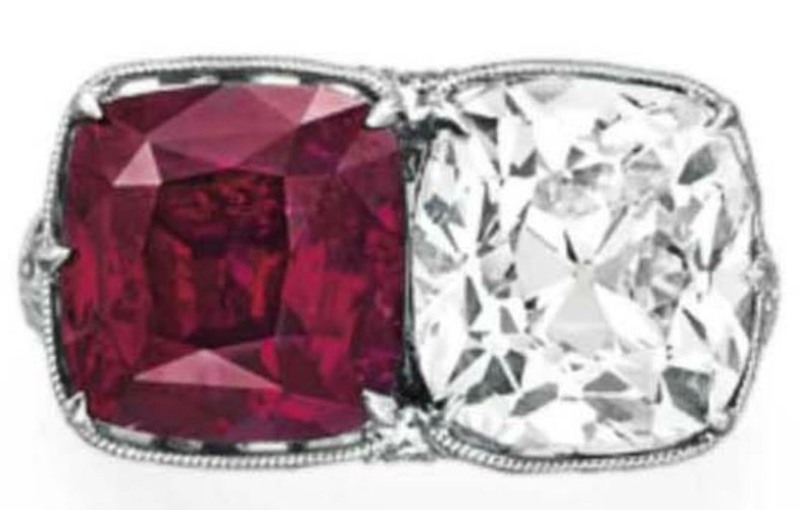 The cushion-cut ruby weighs 7.03 carats and the cushion-shaped old mine-cut colorless diamond weighs 5.00 carats. The shoulders and pierced gallery of the ring are mounted with single-cut colorless diamonds. AGL certifies the Mozambique origin of the ruby with no evidence of heat enhancement. 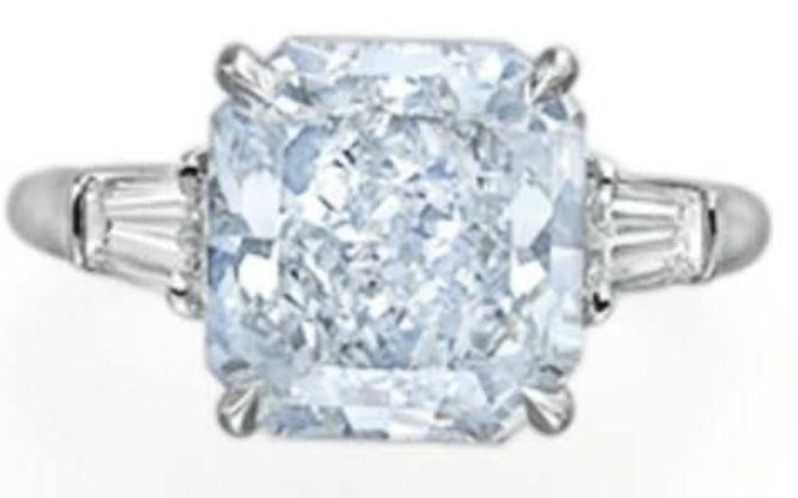 GIA certifies that the 5.00-carat, cushion-shaped old mine-cut diamond is J-color and VS1-clarity. Lot 302 is A Ruby And Diamond Ring by Harry Winston, with an estimate of US$450,000-700,000. The centerpiece of this platinum ring is a 5.25-carat, cushion-cut Burma ruby claw-set with 18k gold, flanked on either side by a triangular-cut diamond. 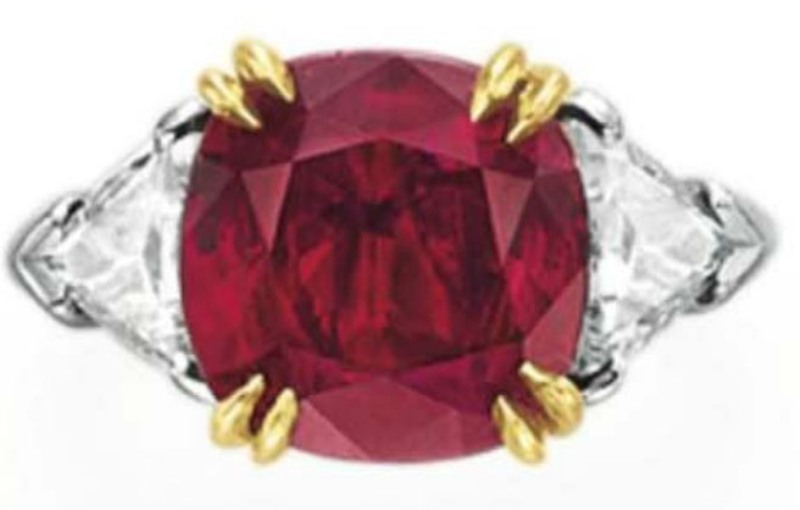 AGL certifies the Burma origin of the ruby, with no gemological evidence of heat enhancement. Lot 78 – A Ruby And Diamond Ring – has a pre-sale estimate of US$200,000-300,000. The centerpiece of the platinum ring is a 5.85-carat, cushion-cut Burma ruby mounted and claw-set in 18k gold and flanked on either side by a half-moon diamond mounted in platinum. SSEF certifies the Burma origin of the ruby with no evidence of heat enhancement. 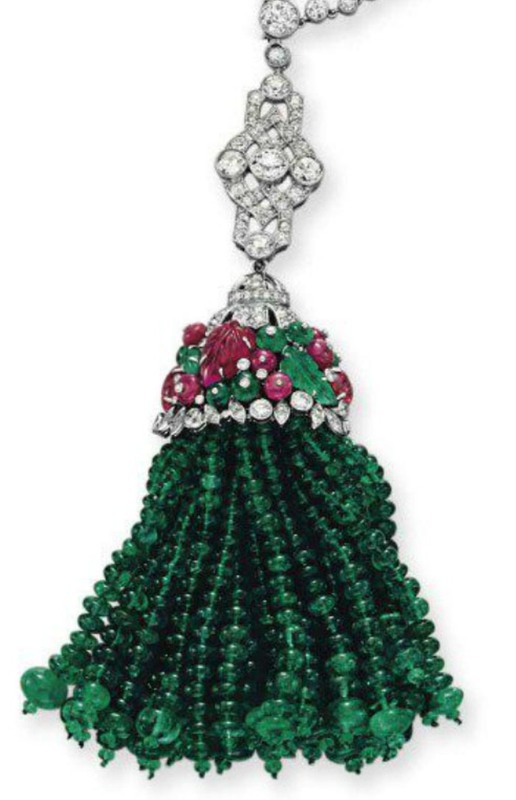 Lot 322 with a pre-sale estimate of US$350,000-450,000 is titled An Art Deco Diamond, Emerald And Ruby Sautoir, by Boucheron. The 82.5 cm. 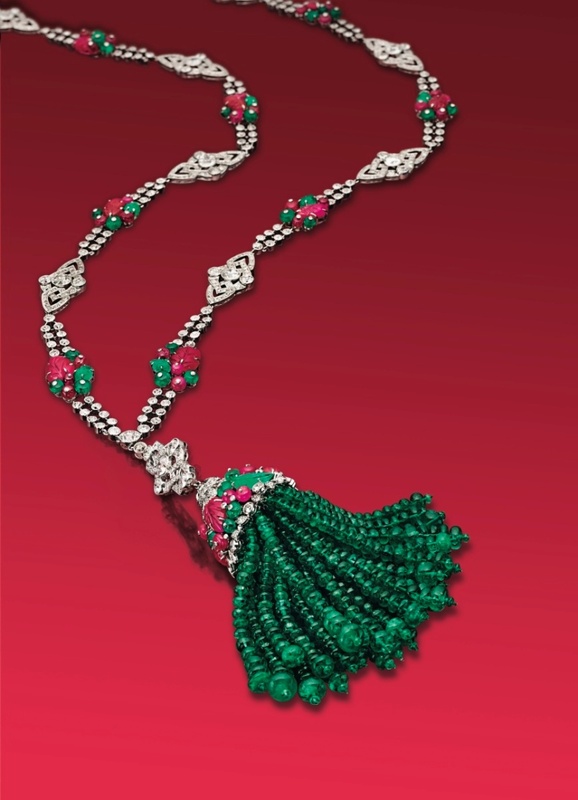 sautoir designed by Boucheron around year 1925, is composed of a two-row collet-set old European-cut diamond necklace, interrupted by nine openwork links collet-set with old European-cut diamonds, and eight plaques alternating with the openwork links, each plaque set with a carved ruby and emerald and three ruby beads and two emerald beads, mounted in platinum and 18k gold. 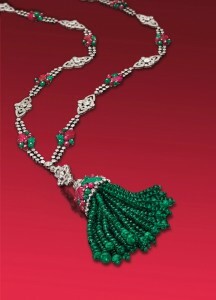 The necklace suspends a detachable emerald bead tassel pendant, arising from a cap set with carved ruby and emeralds of foliate motif, enhanced with emerald and ruby beads and old European-cut diamonds, the cap in turn attached to an openwork circular-cut diamond surmount suspended from the necklace by a hook. Lot 223 – An Emerald And Diamond Ring by Van Cleef & Arpels – with an estimate of US$200,000-300,000, is another important emerald lot from the sale. 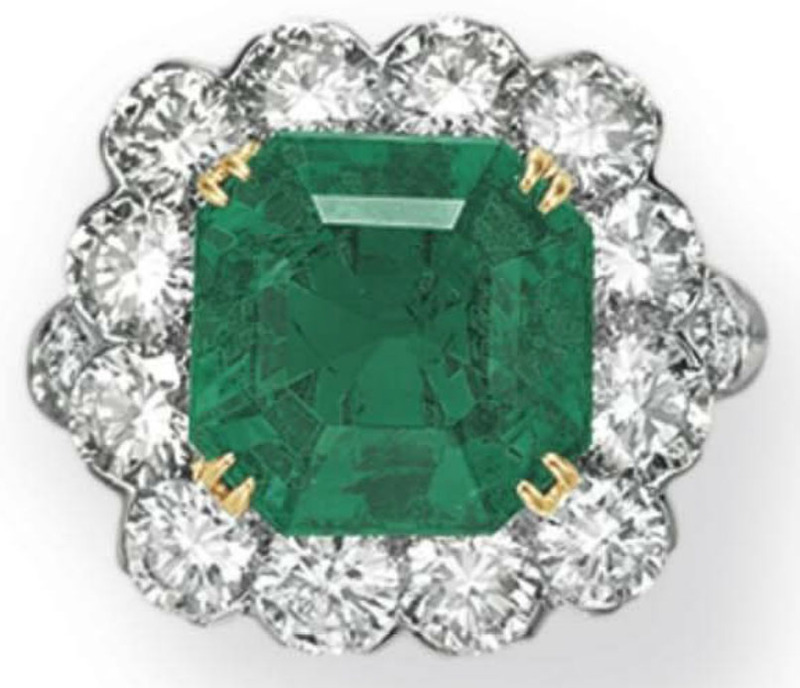 The centerpiece of this ring is a 7.12-carat, square emerald-cut emerald, claw-set with 18k gold and highlighted by a circular-cut diamond surround, and the shoulders also set with circular-cut diamonds, mounted in platinum. AGL certifies the Colombian origin of the emerald with minor traditional clarity enhancement. 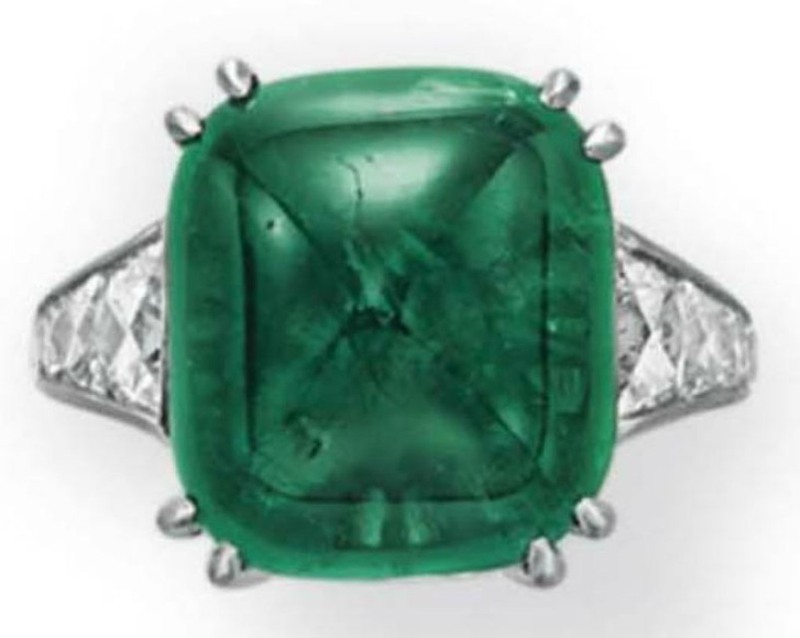 Another emerald highlight at the sale is Lot – 219 – An Emerald And Diamond Ring – with an estimate of US$130,000-180,000. 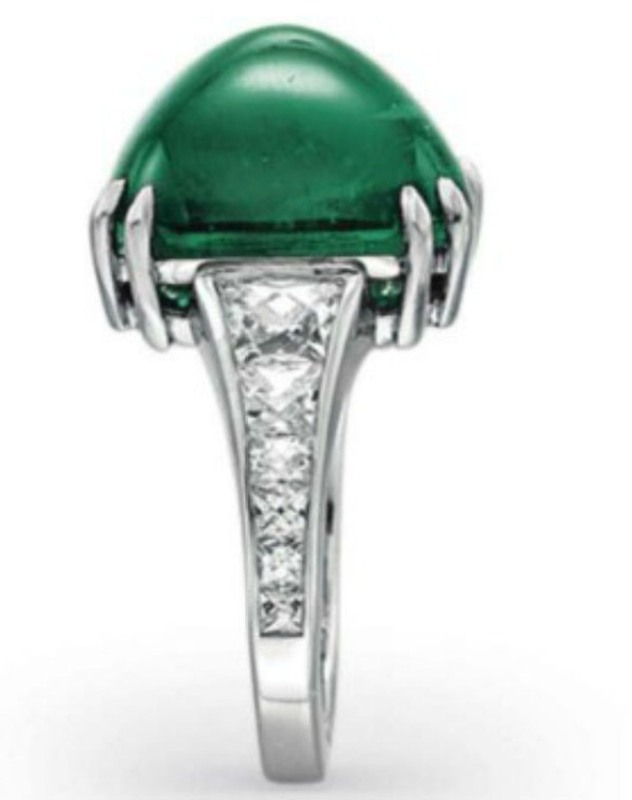 The platinum ring is claw-set with a 11.52-carat, cushion-shaped cabochon emerald and the shoulders are set with graduated French-cut diamonds. Both AGL and GGL certify the Colombian origin of the emerald, with minor oil-type clarity enhancement. Lot 109 designed by David Webb is a Pair of Emerald, Sapphire and Diamond Ear-Pendants, with a pre-sale estimate of US$120,000-180,000. 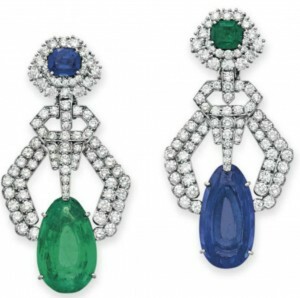 An interesting feature of this pair of ear-pendants is that while one pendant suspends a pear-shaped emerald with a blue sapphire surmount, the other pendant suspends a pear-shaped blue sapphire with an emerald surmount. 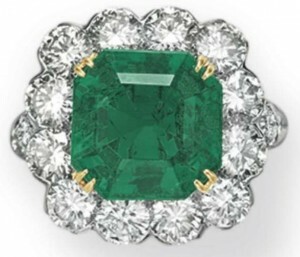 The pear-shaped emerald weighs 17.30 carats and is suspended from a geometric openwork circular-cut diamond plaque, with a surmount set with a 1.90-carat cushion-cut blue sapphire, within a circular-cut diamond surround. 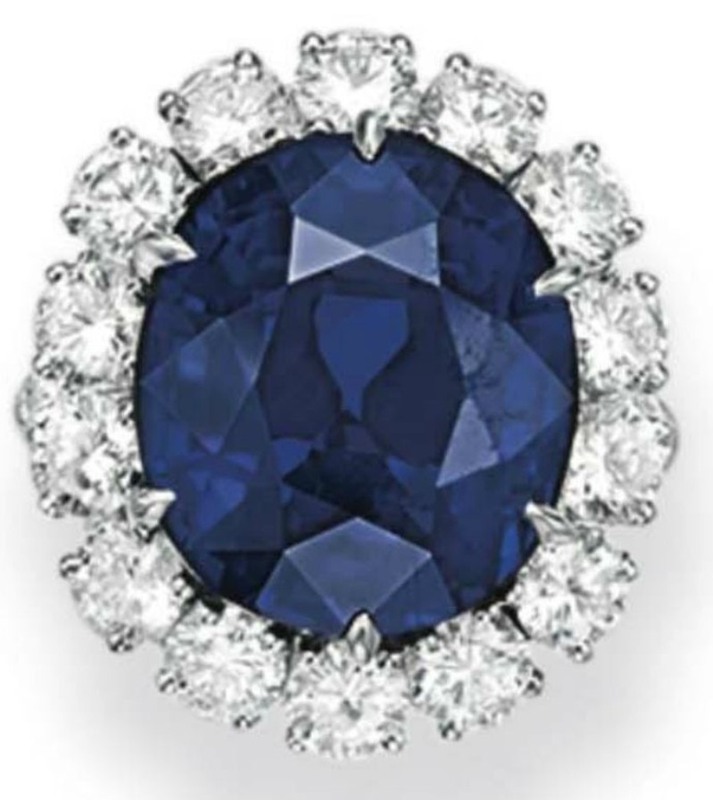 The matching pear-shaped blue sapphire weighs 19.75 carats and is similarly suspended from an openwork plaque, with the surmount set with a 1.99-carat rectangular-cut emerald, with a circular-cut diamond surround, mounted in platinum and 18k white gold.